You can import your Ebay, Amazon, SellerDeck, Shopify, Magento, osCommerce, BigCommerce, RomanCart, eBid, XCart, Oxatis, Groupon, Wowcher, Paypal, Cdiscount. ekmpowershop, Etsy, Flubit, OpenCart, PinnacleCart, PrestaShop, WooCommerce, Weebly, ChannelAdvisor, ASOS Marketplace, OnBuy, Mighty Deals , Mail Order and Telephone Sales into Xero as a series of Invoices, into a selected account. All invoices are imported as a single customer (Sales) for a single product (Goods). The total invoice cost and VAT is split into the relevant accounts. 1 If the Xero view isn't available you can Import the view from the installation directory (e.g. C:\OSOP\Main) or click here. For information on how to import views click here. 2 Tick the orders to export and click on the Export Orders button ( ) and select Xero. This will create an CSV file in the C:\OSOP folder. 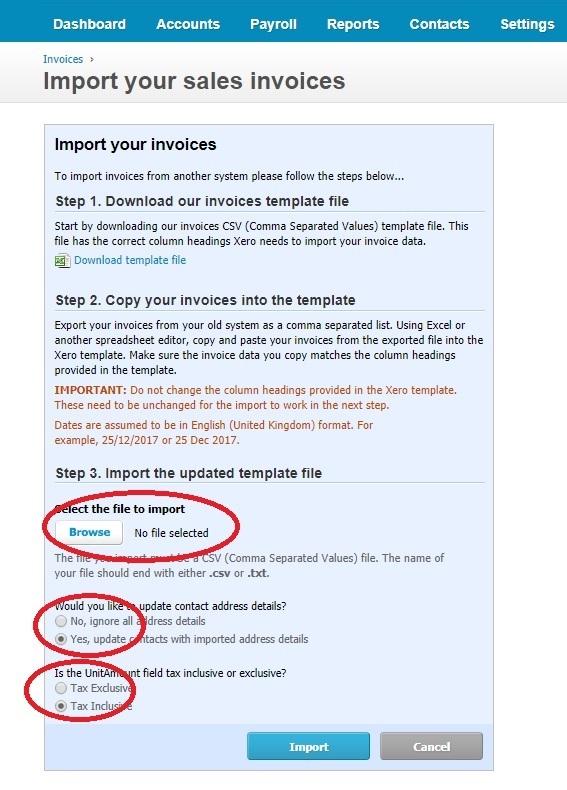 If required, you can change the name by selecting the Xero View and selecting the View->Change Export Options menu option or click on the button to the right of the View selection field ( ). 4 Follow the menu option Accounts -> Sales menu option, shown below. NOTE : Orders will be imported into the Xero Sales Account. If you want to import this into a different Xero account you should create a new account (In Xero, in the Settings->Report->Chart of Accounts page). The Tax is split at 20%. You can change this to a different rate (or use different Tax rates using a macro) by changing the value of the *TaxType field in the Xero One Stop Order Processing view. 8 The orders should then be imported.